Though health care reform has been passed in the U.S. House of Representatives we all know that the best cure for what ails you is seeing a really good bird over the weekend. So, where did you bird and what did you see on this weekend after Election Day in the United States? Tell us about your best bird. My best bird of the weekend was my first Blue-winged Teal for Nassau County, New York, on a Queens County Bird Club trip. We may not have been in our home county but we found our way around rather well on an unseasonably warm November day and tallied well north of forty birds on our half-day trip. 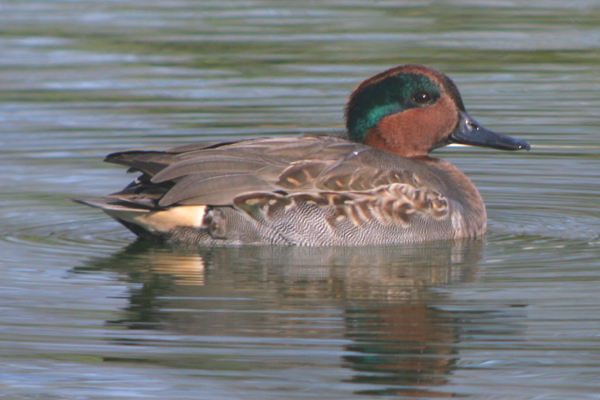 The Blue-winged Teal wouldn’t come close enough for a worthwhile photo but the Green-winged Teal below did. Mike’s best bird of the weekend, which he is spending at Hotel Mocking Bird Hill, the lucky stiff, was a Jamaican Tody, which he spotted while rafting down Jamaica’s Rio Grande. He might think he’s in a tropical paradise but will he ever be upset when he gets back and learns that he missed the last nice weekend of 2009 in New York. I just hope it is snowing in Rochester by the time he gets home, not that I am jealous of his trip or anything. Charlie spent his weekend maxin’ and relaxin’ in his country estate. I understand that he has taken to wearing a bathrobe at all times of day and smoking a pipe, or, at least, that is what I have heard from reliable sources. Instead of birds, he is even focusing on bats and bugs and stuff. Mike leaves for one weekend and all kinds of craziness breaks out! What was your best bird of the weekend? Tell us about the rarest, loveliest, or most interesting bird you observed in the comments section. Plus, if you’ve blogged about your weekend experience, I invite you to include a link in your comment. I spent the weekend working on my ID skills for Scaup and Gulls. With the report of a Thayer’s Gull here in Ithaca Saturday evening, I headed out Sunday morning to see what I could find. Nothing but young Herring’s at the lake so spent some time studying Scaup trying to sort out which ones were Lesser and which ones were Greater. Really interesting birds and I think I finally got a grip on it. Another report of the Thayer’s came in so I tried another location. No luck there but did manage to get my first Iceland Gull, a nice concession. All in all, a beautiful day with a new bird, its hard to beat. Western Kingbird, Villas, New Jersey…No…Northern Goshawk, Cape May Point Hawk Watch….No…Swainson’s Hawk, Beanery…o.k., I’m going with the Goshawk ’cause it flew low, right over our heads, circled around, and then perched in front of us and had everyone on the platform, even Pete Dunne, cheering. One of those very exciting, hand-smackin’ birders’ moments. The QCBC Southshore Potpourri is always fun too . I don’t get to see Brant too often in my neck of the woods. Plus my 1st Common Goldeneye of the Season. @Drew: Practice makes perfect, right? And I don’t believe in Thayer’s Gulls. @Andy: That is one of the few English names that I like better than the American. @Will: Having lived up in Albany I understand why the Brant are a marvel up there but considering the sheer number of them I see every winter it is hilarious that they are a best bird. Most of my birding this weekend was on our acreage here In Amish Country, Ohio, but I was driving to the village of Walnut Creek and suddenly overhead was a bald eagle which landed in a tree on the hillside. Even without my bins I got a great look. When will I learn not to leave home without them? Even though they are becoming more common in this area they’re still exciting to see!